No fewer than 10 people died in an accident on the Ife-Ibadan expressway on Sunday. The Police Public Relations Officer in Osun, DSP Folashade Odoro, confirmed the incident in a statement in Osogbo. Odoro said six females and four males lost their lives in the accident which occurred at 12 pm. Odoro said the accident involved a Toyota Hiace bus marked MUS 702 XZ and a Iveco Tanker with number plate YNF 327 XA. 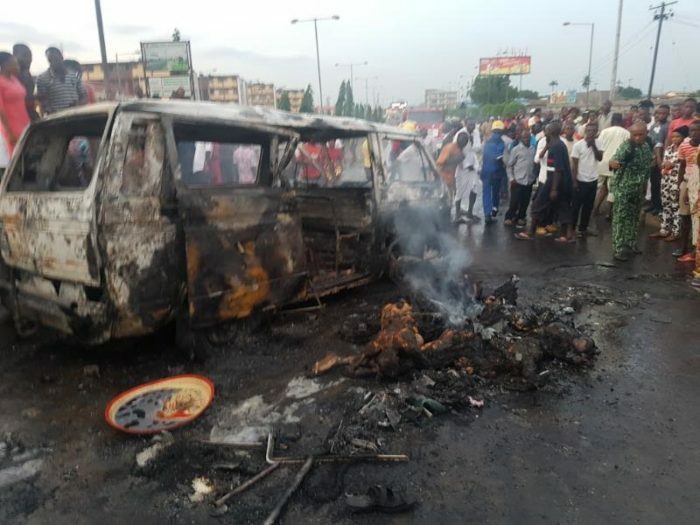 The spokesperson said the bus was coming from Ore in Ondo State and heading to Ibadan before it rammed into a tanker attempting to make a U-turn on the expressway. The tanker was said to be conveying petrol and the collision resulted in an explosion. Odoro said that the corpses had been deposited at the morgue of OAUTHC for autopsy while efforts were ongoing to remove the vehicles from the scene of the accident. The police spokesperson, who identified the bus driver as Najimu Akanni, added that the name of the tanker driver had yet to be ascertained.